The Gulf Stream is a warm water current flowing from along Florida to Newfoundland. The water can be moving at a speed of up to 4 or 5 knots and is noticeably warm. The issue with the Gulf Stream is that when there is substantial wind with a north component the water moving north reacts with the air moving south to create waves that are considerably larger, confused and square. Boats get rocked and slapped and smacked. 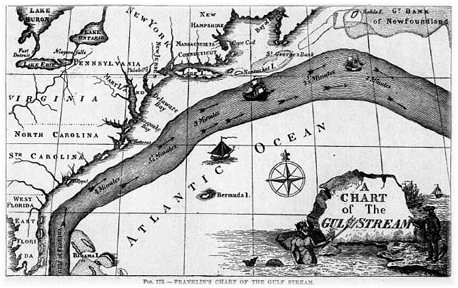 Luckily we had this modern chart of the gulf stream. Not sure where Dawson found it but it seemed to be on animal skin. I’m just glad we didn’t run into that guy with the pitch fork, we hit everything else. As I mentioned in part one it was important for us to get south as quickly as possible to avoid the cold front and the associated north winds. We left Hampton almost exactly on time. Prior to leaving the dock we reefed down the main to the second reef and changed out the head sail to the 110%. Both of these decisions were appropriate when the winds piped up and began pushing us with constant pressure south. The winds were abeam and steady and day one we made just shy of 200 nautical miles. This is quite a feet for a 40 foot boat. Jazzebelle is a Caliber 40 LRC or long range cruiser, which is an extended transom 38 with extra tankage and is a stout variant. The Caliber 40 has a fully encapsulated, elongated fin keel that has an iron and concrete ballast of 9,500 pounds. Her ballast to displacement ratio is a very respectable 44% which is good to find on a boat intended for bluewater use. The rudder is skeg hung for protection and tracking and her waterline is just over 32 feet. The ballast to displacement ratio was very noticeable on this trip. She tracked like a blood hound and together with her partner Jim (our autopilot) she made what could have been a dicey and uncomfortable passage something that we could endure. You would think that the gulf stream would have a yellow line around it or some easy way to tell when you are in it…it just seems to happen. Without GPS it would be difficult to detect that almost instantly you are giving away 2 or 3 knots to the moving ocean. Using GPS makes it easy. You are sailing 7 knots through the water with a speed over ground of 4. When that happens you are leaving some speed on the table. Your 70 knot crossing that you mistakenly thought of as 10 hours becomes 17 plus hours to cross. The other indicator is the amount of drifting sargasso weed on the surface, it really is noticeable. The seas as advertised became very confused and the motion of the boat had irregular oscillations of all dimensions; rock, pitch and yaw. I had three watches during our crossing and three 4 hour sleep periods. I had the quarter berth on the starboard side and together with my luggage had quite a ride while sleeping. I had two fabric softener sheets in my pockets just to soften the gyrations. But I did sleep. None of the crew had any inklings of sea sickness which was a blessing. Jim the autopilot made this passage possible. If humans had to steer through the gulf stream it would have been exhausting and our course would have taken longer I’m sure. The wind through this was 20 to 25 with gusts of 30+. The other factor is the wind effect on the boat while it is moving at a reduced rate over the ground. Every now and then all the gyrations peak and you hit a square wave with a thump. The casualties of the stream where the bow light and the tail vane on the wind generator. The tail vane was left hanging on the string and was still there when Dawson went out to lash the thing down. The lens on the bow light was gone and the light was pouched by the sea water. I suggested that the captain look through the spares for some sort of innovation for a bow light as we had several more nights ahead and it would help vessels around us if they had a clue which side of the boat they were observing. We had AIS on board and our system transmits as well as receives and it was invaluable to us during the crossing. AIS allows you to hail a vessel by name rather than “I am the 40 f00t sailboat calling the vessel behind me”. It is reassuring to hail a vessel when their path will come close to you. We had a small cruise ship approaching us from the stern and we hailed them and they steered a little farther off us as they passed. I was surprised to learn that a lot of the salty dawgs had AIS but only to receive. The system wouldn’t work if everybody only has receivers…spend the extra bucks and get a system that works, you can see them and they can see you. Mount the antenna as high as possible to help get your position out even when seas are high. The captain found another bow light that had a cracked lens. He made repairs using plastic and silicone and wearing rubber boots he and Rob spent some time on the bow up to their knees in green water making the repair. The light still worked when I left the boat. The crossing was made tolerable by our watch system. We had four on board and I really wonder how safely the couples were sailing on some of the boats. We took the helm for the first two hours of our watch and became number 2 for the second two hours doing radar checks and boat checks and clearing the boat 360 degrees visually every ten minutes. In high seas picking out a vessel at night requires a sharp eye. I don’t know why dogs like to stick their heads out windows. I found that the only way to get a good look and my tongue got sore from the flapping in the wind. I wish I had pictures of the crossing, but cameras and ipads where not on my list of priorities when we were crossing the stream. Quel voyage pour le capitaine du svFracas. Quelle histoire a raconteur, quelle aventure, quel narrateur. Merci d’ avoir partage tes nouvelles et bonne chance !! I am very surprised that you have learned French in my absence. Or have you learned Google translation. Either way I am sailing with a frenchman and I am the captain of a french boat. Both surrender easily and often. Hope things are going well on the island now that the wind has passed. I knew you would have no trouble translating. The girls are both bilingual, having finished their education in the French language in France, so I sent my message to Cheryl to proof read. She had to make a few changes???!!!! Also sent her your blog so you may hear from her. JMB.